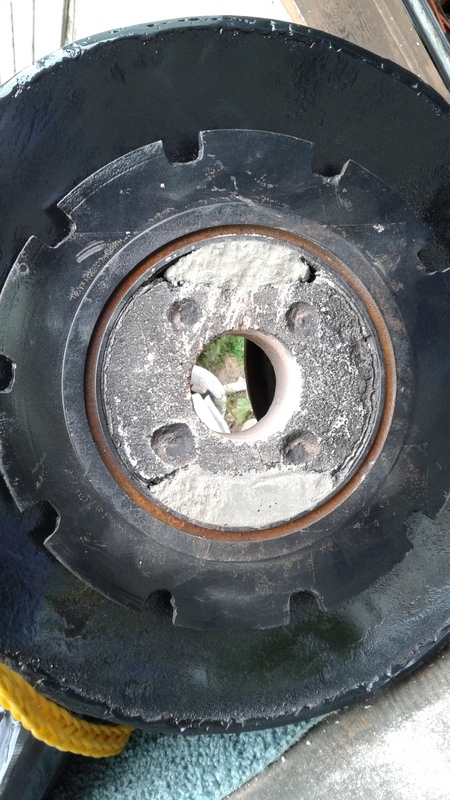 That reminds me of an idea I had at Argos… Carl was showing off his fernco caps with wing-nut style hose clamps. He mentioned having to special order them. It occurred to me that you could tack weld a small washer into the flat-head slot of a normal hose clamp and have the same effect. Similar to Pepe’s arrangement above. I put the inspection/maintenance hatch on and bolted it down with silicone gasket in a tube. Put the end plate on and tighten it down, it has a good fit and seal. Flipping it over, I am noticing it is getting heavier, about 80 pounds now. 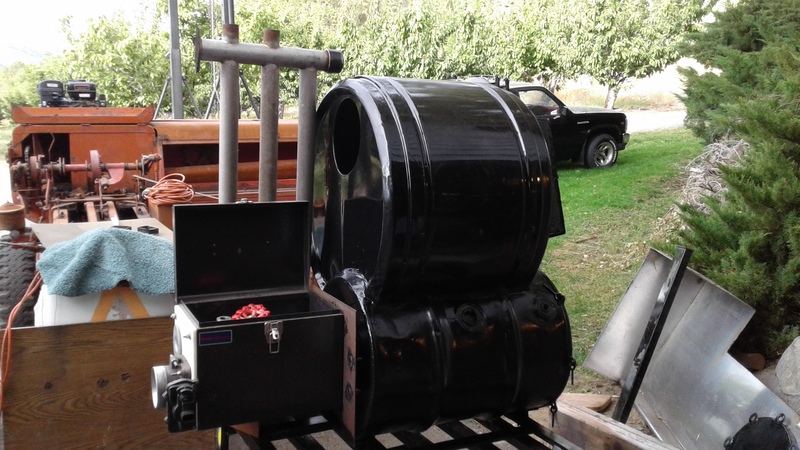 With the nozzle box and valving in side of it attached and hot filter/cyclone mounted, it will be pushing 100+ pounds. I was hoping it wound be under 100 pounds. Oh well my be on my next build. 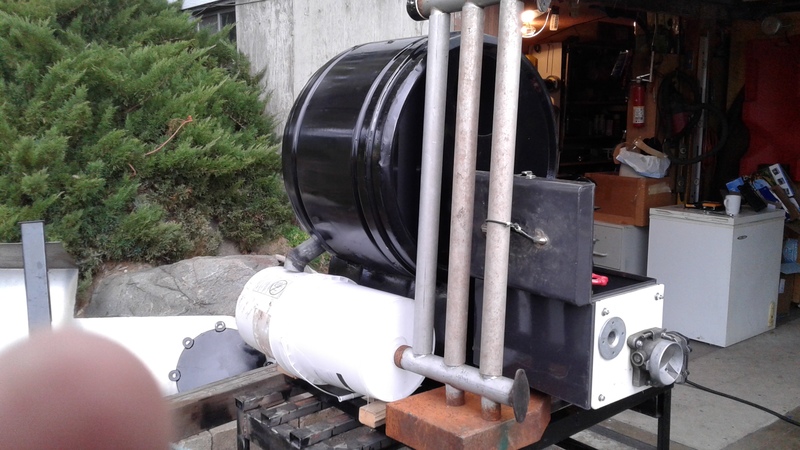 Yup I need a Dark Side Simple Fire Gasifier to run the Chunker, YES? I already have the Stainless steel container built. You could say I have a lot of projects going at the same time. If they get finished in a month that would be great. I like painting the Gasifiers any color, as long as it is BLACK! Sure is pretty and shiny. Let dry and then paint on the other side. Might leave the nozzle box gray, will see. Yahoo! Keep those cards and letters coming. I know the dark side is not as explosive but all it takes is once! Hi Michael, the side opening on the hopper will have a fill spout puff lid. 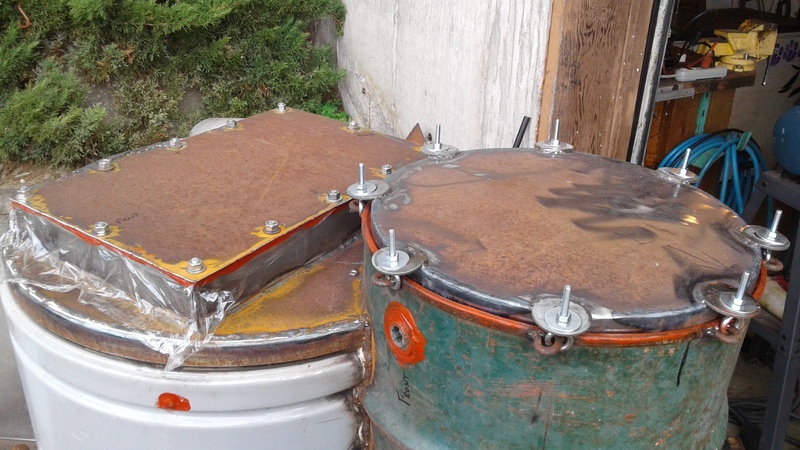 The round side plate at the bottom part of the gasifier will have springs, have not installed them yet. It’s coming along, need to check the insulation in it with just charcoal and check the charcoal 60* slope in the nozzle feed area. That will happen when I get ready to fire it up. To test it I am going to put it on the back of the Dakota and hook it up to the back of the cooling rail, that drains on down to the condensation tank under the truck. I will also need to cap the wk gasifier intake under the truck. I was looking at my stock pile of charcoal, I think I better start up the retort tomorrow, now that the burn ban has been lifted over here in Douglas County. 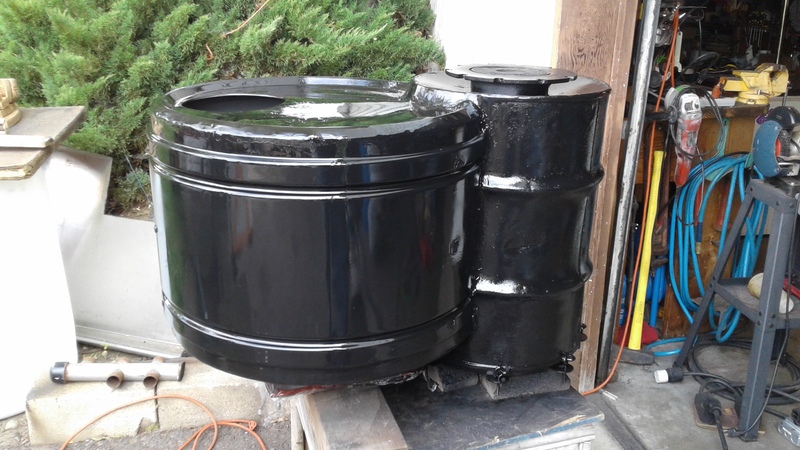 When I get ready to light this gasifier up, I would like to have 60 gals of charcoal. I only have 20 right now, it probably will hold that much. Maybe I should make 160 gals. Ever since I saw the simple fire working I have wanted to build one. My stainless steel container is going to be a simple fire. I am try to K.I.S.S. this one. (keep it simple siimple). Wish me luck. Hi all, my order of refactory cement came in yesterday, so mix some up and put it around my fire brick. Going let it dry for a few days. This should take care of this area of the fire nozzles. Next is building the botton frame to hold this Want To Be Gasifier. It 1 1/2 times heavier in what my guess of the weight was going to be. What I have found in build is this, if you build from new materials and make everything. you can build it lighter. If you use parts already made they might be heavier then what you need. So my new factoring figure will be this, times 3 of what my guess weight will be. That way it will come out lighter when the project is finished. But it better to be over built than under built. You don’t want it to fall apart going down the road. My little want to be gasifier is standing up all by its self on the base support stand. Because it more than twice the weight I thought it was going to be, I’m going to mount some swivel caster type wheels under it so it can be moved around on the frame. This will make it a lot easier to work on. Sizing up the cooling rails, condensation tank below the rails and where the hot gas filtering metal container will be with a couple of white plastic buckets and a piece of pipe. 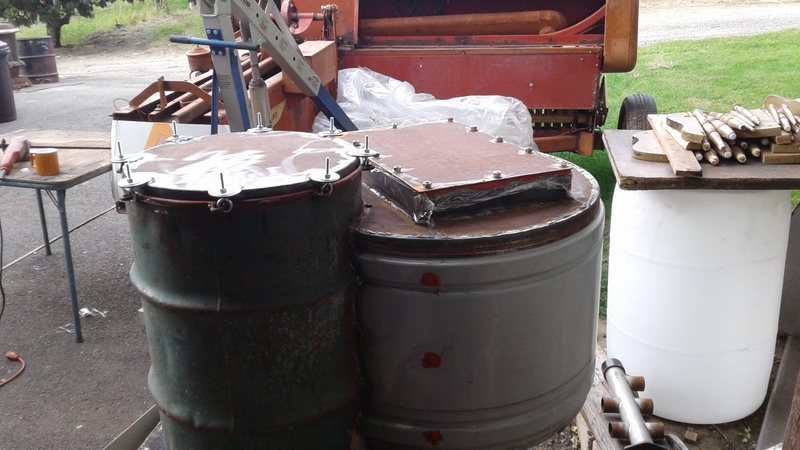 The ash clean out and filter service plate for the hot gas filter will be on the bottom where the white bucket is. @Chris, you might notice what I’m using for the cooling rail trees. Removed them from the 92 Dakota cool rail system. Don’t throw anything away, it can be used on something else. Koen, and All, It has been a long time in the works on this project, started this project about 1 1/2 years ago. Did a lot of thinking along the way, working problems out on it. Got side tracked a bit, Bought The 92 Dakota From The Book from ChrisC. Brought it home and completely rebuild the fire tube and other things. 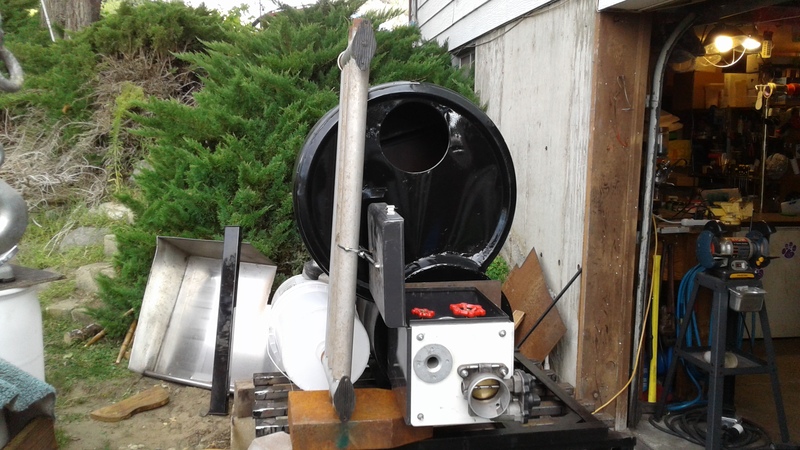 Built my Charcoal Retort and Charcoal Grinder Trommel Classifier. Lost my 1996 Subaru Out Back donor car, because Dana loves driving it so, and she gave her 1996 Subaru Lagucy to our teenager Marjie so she would a car to drive back and forth to high school. Started building my Wood Chunker almost finished with it. Ha Ha, life goes on, Thank You Lord. Today was one more step closer to the Dark Side of Gasification. You Just Got a Love It. Thank you so much for posting pictures. This is an exciting build. Hopefully you will be driving around with it before long. Its great seeing your vision take shape. Wow, my hat is off to you ! Big time. Amazing people on DOW. 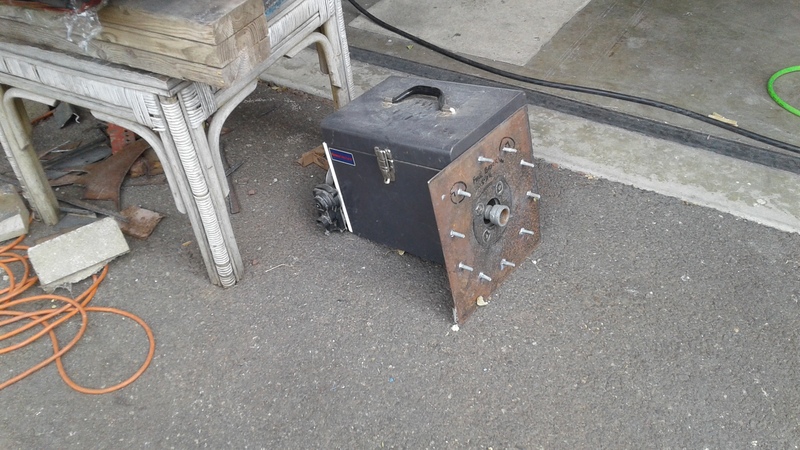 that some projects stare back at you when you walk by, it’s like they are saying… when are you going to finish me, and get me making some charcoal gas to run a engine on. Alright, Alright enough with the guilt trip. You are next in line to get finished. 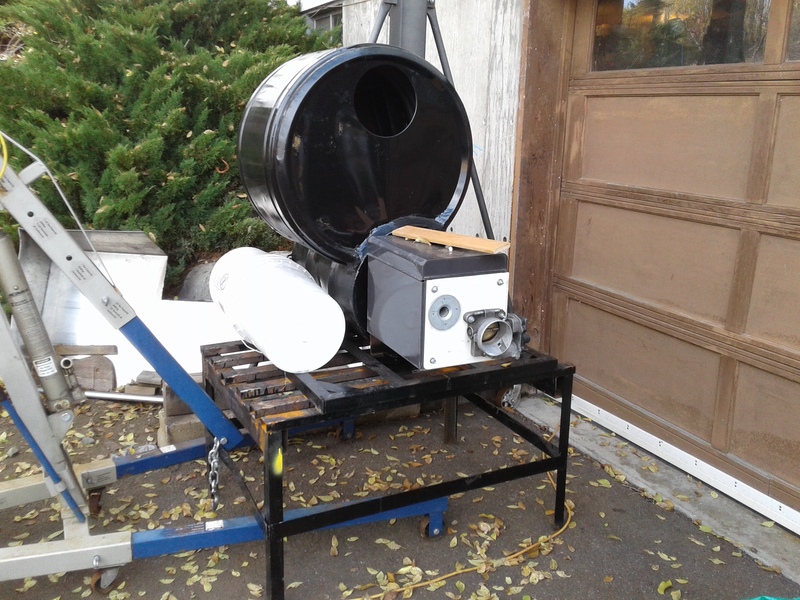 I have three other gasifier and a wood stove project that need to be worked on too. What do you do when you like to drive on gasification too? Gasification it’s got me. Is there a Gasification Anonymous? I think the closest thing to gasification anonymous is this forum, where you admit your addiction and are consequently encouraged to pursue it, just don’t inhale the CO! encouraged yes, but only with the associated demand for audio visual verification. last week, wife and i, walking in a shopping mal , tools and stuf section, she say, pointing towards some iron part and asking me " can’t we make a nozzle from this ?" 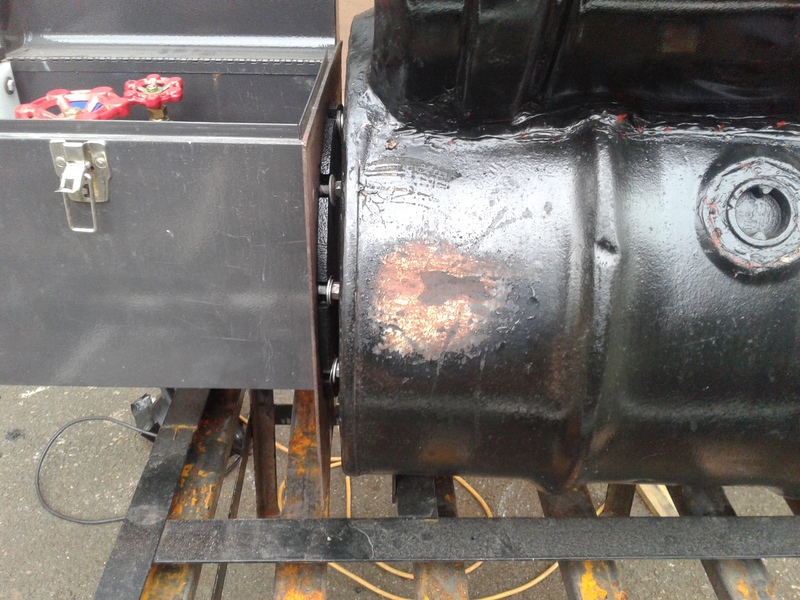 The Gasifier That Wanted To Be, NOW IS! 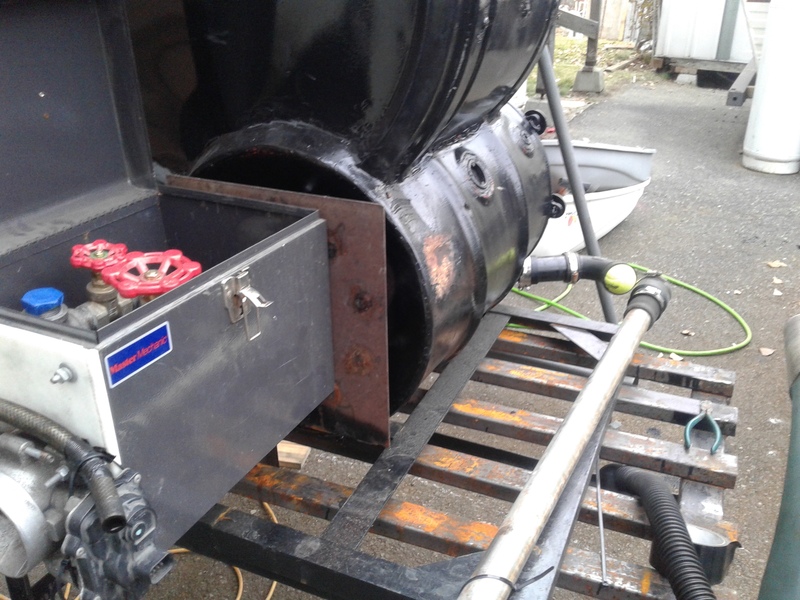 a charcoal eating gasifier as of today. It shot out of the gas flare nozzle a 3 foot beautiful flame. By the time I was going to take a picture of it, the notice THIS! And shut it down quickly, something is not right. Might be a leak on the edge of the barrow. 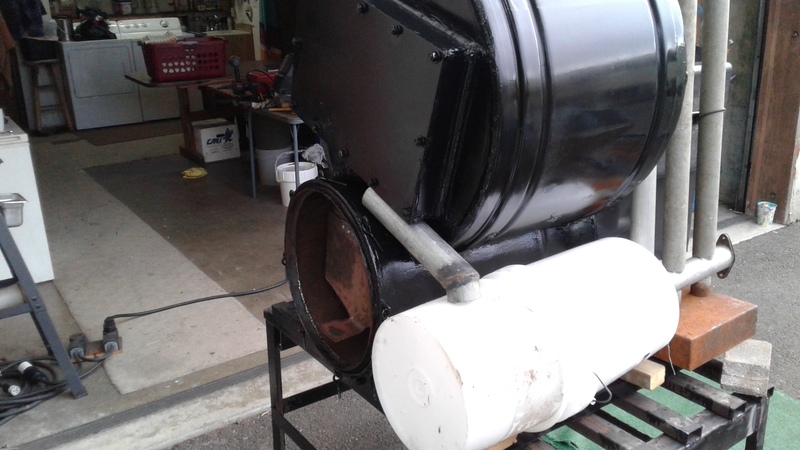 The next run will have the cooling rails on, this single pipe started to get warm to the touch. The rest of the fire tube barrow was warming up. The concaved disk where the nozzle comes out started to burn paint off, so my conclusion is the ceramic wool is going to be installed like I originally planned. 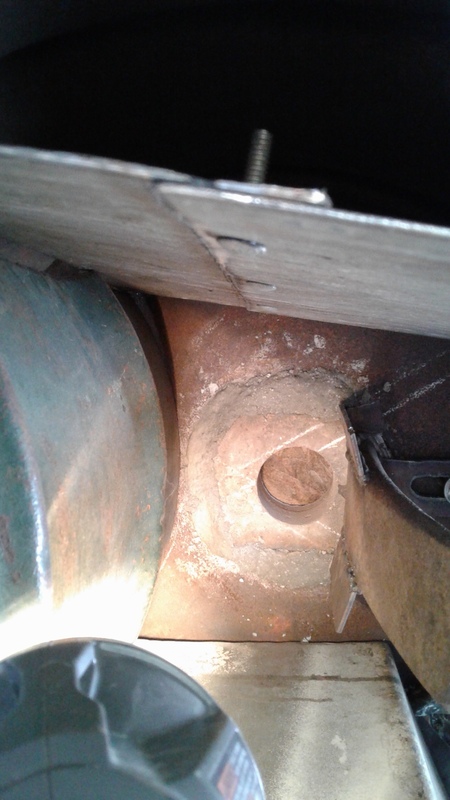 Looking into the gasifier intake opening I could see the charcoal was not touching the nozzle when running. The bed of charcoal had a slope to it, away from the nozzle like planned. The big heavy piece of steel above it was glowing. I use my truck exhaust to keep the heat under control on the lobe of charcoal fire just pass the nozzle. All in all I’m very happy with the short run. Just letting it cool down and die out so the can inspect it, FIX the air leak, and put the insulation in.